In studying the Septuagint, I’m regularly curious about how often the LXX translators used the same Greek word to translate a given Hebrew word. How often, for example, does καρδία translate the Hebrew לבב? And what other Greek words are used to translate it? Similarly, I wonder, for occurences in the Greek text of καρδία, what other Hebrew words might it be translating? Takamitsu Muraoka has made such questions an emphasis of his scholarly writing and publishing throughout his career. His Greek-English Lexicon of the Septuagint is one of the standard lexicons in the field, and his Greek-Hebrew/Aramaic Two-way Index to the Septuagint is the best thing I’ve seen in print for Hebrew-Greek lexical studies in the Septuagint. Preceding that latter work was Muraoka’s Hebrew/Aramaic Index to the Septuagint: Keyed to the Hatch-Redpath Concordance. 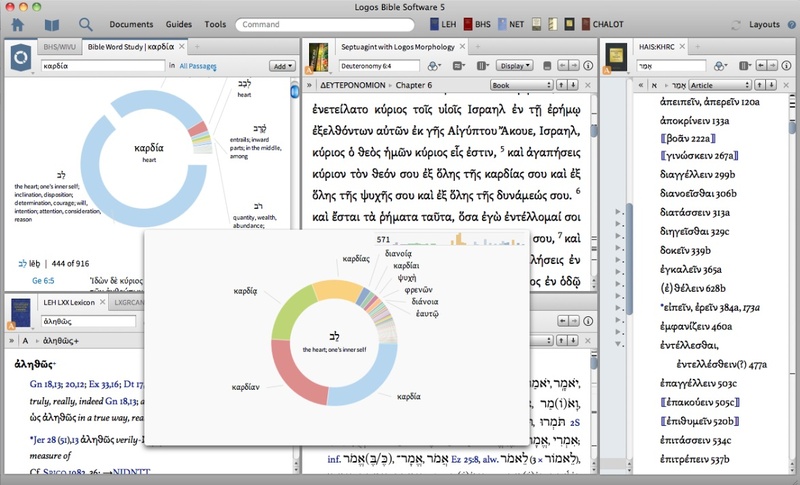 I’ve had a chance to use the work in Logos Bible software; this post contains my review. אָמַר qal 37 c, 74 a, 109 c, 113 c, 120 a, 133 a, 222 a, 267 a, 299 b, 306 b, 313 a, 329 c, 339 b, 365 a, 384 a, 460 c, 477 a, 503 c, 505 c, 520 b, 534 c, 537 b, 538 b, 553 b, 628 b, 757 b, 841 c, 863 c, 881 c, 991 b, 1056 b, 1060 a, 1061 a, 1139 a, 1213 b, 1220 c, 1231 b, c, 1310 b, 1318 b, 1423 c, 1425 b, 69 b, 72 b, 173 a, 183 b, c, 200 a (2), 207 c, 211 b. Whereas the Greek to Hebrew portion of HR lists the Hebrew words underlying the Greek of the LXX, the Hebrew to Greek portion at the back just has page and column reference numbers, as above. So the user of HR would have to turn to page 37, column c, page 74, column a, etc., etc., in order to see what Greek words were in those locations. Only in that tedious way could the user of HR see all the Greek words used to translate the Hebrew אָמַר. …and so on. The HR page and column numbers are retained, but now the user doesn’t have to flip back and forth, since the Greek words are all in one place. T. Muraoka then took his wife’s data and critically examined HR’s assessments in as many places as he could, drawing on advances in the past century in textual criticism, manuscript availability (like the Dead Sea Scrolls), and adding in analysis of “apocryphal” books, which HR had not fully included. The resulting revision updates both HR’s work and his wife’s manual collation. What results, then, is an eminently helpful work where one can look up any Hebrew word and see all the Greek words used to translate it across the Septuagint. To be able to do this is valuable, and Muraoka makes it easy. There are two things that lack here, though neither one of them is really the goal of the work, so I don’t actually criticize it for these omissions. First, there are not frequency numbers. It could be especially helpful to know not only what Greek words translate a given Hebrew word, but how many times each does, so that the user can get a sense of the distribution of each. Muraoka doesn’t have this. Second, he doesn’t have glosses or translation equivalents for words, so there is no English in this index. But this is an index, and marked as one, so neither of those is a flaw in Muraoka’s book. 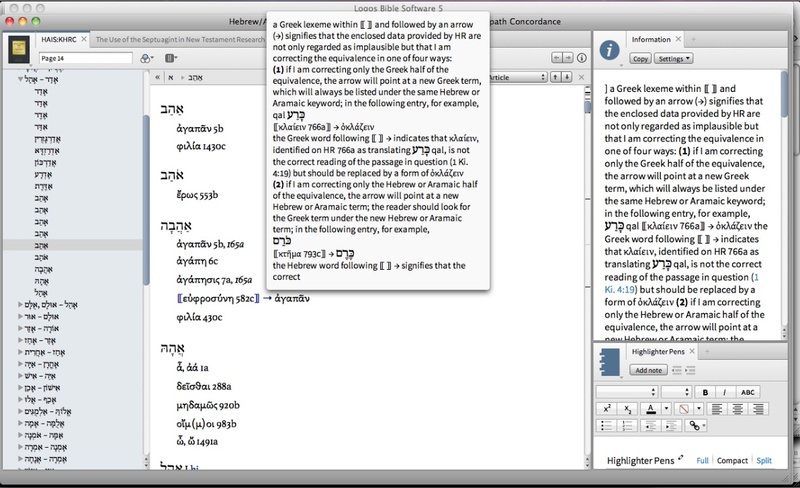 In fact, here is where using Muraoka in Logos is especially helpful: you can tie tabs together so that a simple click from Greek or Hebrew in his index takes you to a corresponding Greek or Hebrew lexicon in Logos, where you can see that word’s meaning. Logos in this way really enhances Muraoka’s tool. And, of course, frequency statistics are easy to come by in Logos. But if you’ve got the money (especially if you qualify for an academic discount), and are sitting on the fence about Muraoka’s resource, I recommend it. It’s nice to have easily at hand a listing of all Greek words used to translate a Hebrew word in the Septuagint, even if there are other ways to get that information in Logos. Here it’s consolidated. You can see there are no verse references given, which are useful for in-depth study of Greek translations. Muraoka’s more thorough Greek-Hebrew/Aramaic Two-way Index to the Septuagint offers more depth in this regard than this 1998 Hebrew/Aramaic (one-way) index. No Bible software currently offers the two-way index, but it would be great if Logos were able to make it available in the future. All in all Muraoka’s Hebrew/Aramaic Index to the Septuagint is a solid resource. And its digitization in Logos has been well done, too. Logos can already accomplish much of what’s in this index, but the one serious about the Septuagint may want to have any and all tools at her or his disposal. In that case, this is a worthy addition to one’s library. Thanks to Logos for the free review copy of this work, offered without any expectation as to the positive or critical nature of my review. Muraoka’s Hebrew/Aramaic Index to the Septuagint is available in Logos here.